With golf courses drying out, the Pattaya Golf Society travelled to Pleasant Valley on Wednesday, 14th October to play a stableford competition from the blue tees. The front nine was in good shape with soft fairways allowing some run and the greens were consistent if slow. The back nine was a problem with greens similar to egg boxes, covered in Velcro! A lack of cutting opportunities had left uneven surfaces with overgrown spiky grass that made putting a problem. However a day on the golf course is still better than one in the office and the field made headway where they could. In a lowly third place was Mr Len with 27 points, the back nine being his nemesis, whilst Jim Proctor fared much better finishing with 32 points for second place. In the final group Danish golfer Jorn Eriksen was making the most of every opportunity and his birdie ‘2’ on the eighth served as a spur to complete his round with 36 points for an emphatic win. 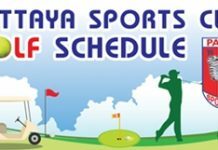 Meanwhile the Lord Buddha is still being petitioned to call an end to the wet season as soon as possible so Pattaya golfers can take full advantage of the challenges on offer at the province’s unique golf courses. A call from Crystal Bay the day before led to the Pattaya Golf Society redirecting its GPS to Mountain Shadow on Friday, 18th October, to play a stableford event in the drier of the sister courses. As expected, a crowded first tee greeted the group but being given priority the PGS golfers set out on time on the testing track, from the blue tees. Good progress was made until the threatened gloom descended around the eleventh hole and for five of the golfers the deluge was too much and they withdrew to the comfort of the clubhouse and a hot shower. The rest meanwhile continued and finished their round with Steve Jones and new member Gordon Angus sharing third place with 28 points. A birdie ‘2’ on hole five was some consolation for Gordon and the following group also saw Brian Shaw complete the feat, allowing him to finish second with 30 points. The winner was again Jorn Eriksen and his form showed all the signs of the confidence displayed two days earlier. The booby bevy went to Khun Wichai after one of his less impressive rounds and the week ended with golfers sharing a few refreshing beers in their Soi Buakhao based “clubhouse”, Rabbi’s Elephant Bar. Hopefully the energy of the recent typhoon series has now subsided and the group can get about the business of playing golf on good courses in dry conditions!